Oh what a night. We had about 40 people attend the ODZ SkillZ and DrillZ Ride where we went over the highlights of sprinting and climbing techniques. Since we returned to the Event Module again this week, the ride began in the corral. Once we got on the road, the group set out a 1.5 w/kg pace. During warm-up, we went over some of the basics, covering the importance of maintaining a good position within the group, and taking as much advantage as possible of the draft created by the riders up front. As we moved through the flat section of the Richmond UCI course, I laid out the plan for the day. It was pretty simple: we would do two laps, executing two sprints and two climbs per lap. Otherwise, we would practice our group riding skills at 1.5 w/kg. In reality, I knew that most of the interim time would be spent regrouping, as the wide variance of power and experience virtually guaranteed separation. While most of the instructions were passed over Discord, I did my best to relay the instructions via messages, but I am sure that some of it was lost due to lag. In the end, most of the riders seemed to get the intent of each exercise and grasped the learning objectives. Speaking of the exercises, here’s what we did. On lap 1, we focused on using a lead-out rider and resisting the urge to open the sprint too early. The idea behind the two iterations was to demonstrate how a rider can benefit from having a willing teammate or an unwitting accomplice ramp up the speed at a greater rate than the effort being produced by the rider going for the sprint win. 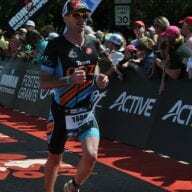 At each of the sprint zones, I moved to the front of the group and began ramping the pace up from 1.5 to 3.5 over the course of the first two-thirds of the sprint zone. At 100 or so meters to go, I gave the signal to unleash the horrific power of a fierce sprint. Using the lead out technique, most riders were able to reach peak power quickly and maintain it for the duration of the sprint. On lap 2, we extended the sprints out further to test our abilities to hold the max effort for the duration and identify our individual limits for time sprinting. Prior to starting the second round, I asked the riders to identify at what point the acceleration plateaued and the point in which power began to drop off. On sprint 1 of lap 2, we opened the sprint up about 100 meters after line on the road designating the sprint zone. Jumping off of my 3.5 to 5 w/kg lead out, almost everyone managed to hold the sprint for the duration. Sprint zone 1, though, is the shorter of the two, so I did not expect anything different. The endorphins quickly disappeared as we grouped back up and the recovery period came to an end. Before we knew it, zone 2 was upon us, and we ramped up the pace to open the sprint. We hit the line, I told the discord users to go, and hit send on the word “GO” to the rest of the crowd, and the rider board looked like it had been set on fire! Red w/kg readings showed under almost everybody’s name, and the sounds coming across Discord would have my grandma blush. It was awesome. The nearly 500 meter sprint was a perfect way to drive home the point of opening up the sprint too early. Some people were able latch on to accelerating wheels, lessening the sprint distance some, but most people did not have that luxury. A few of our colleagues were able to hold the sprint through the line without a complete meltdown, but the vast majority of us surrendered to the lactic acid in the legs and the lack of oxygen in the lungs, as the numbers fell out of the red with 20 to 50 meters remaining in the sprint zone. That sprint may have caused the SDR and ensuing video to be upgraded from PG to PG-13 due to the exhortations of the hurting masses. After the sprints on each lap, we transitioned to an overview of climbing skills. While I generally don’t find the Richmond course to be my first choice, it is a great tool to teach how we can approach different types of climbs. It has both a long, shallow-grade climb and a short, steep climb. 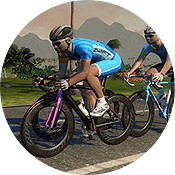 Riders need to approach these climbs with very different strategies, as they cannot be ridden in the same manner if you desire to hang with the group or gap your rivals. On lap 1, we talked about maintaining a rhythm, using the assumption that the climb was not situated in a decisive point or a prime spot for an attack, say early in a race. As a group, we climbed at a 2.5 w/kg, accepting the fact that you will probably have to lift the pace beyond an ideal comfort level on a climb even during the most relaxed portion of a race. We arrived at the top, more or less together, and prepared for climb number two. The maintaining of a consistent rhythm and manageable effort resulted in little need for recovery other than a quick drink of water, as we did not dig deep. On climb two, I directed the riders to climb out of the saddle at a lower cadence, utilizing body weight to push the w/kg up to 3.5 rather than relying solely on power generated through the quads. The steepness of the climb and the shorter distance benefited the riders who could generate and sustain a higher power output, showing the similarities between this type of climb and a longer sprint. On lap 2, we changed things up a little, attacking the first climb with the intent of demonstrating the toll that surging or inconsistent pacing can take on the legs if not planned. I instructed everybody to alternate between a high-cadence, seated effort and a lower-cadence, standing effort at a slightly higher power output, changing every time the road altered direction. Thus, every curve or bend signaled sweet relief or back to pain. By the top of the climb, there were more than a few groans about the ineffectiveness of that style of riding unless attacking. After a very quick recovery, we closed out our hill work by seeing what we could each do on the short, steep climb. It hurt, but everyone did great, holding red level w/kg efforts through the KOM banner. In fact the KOM board was pretty much a mirror of the SDR rider board. After the last climb, we did a quick recap of the day’s learning objectives and began our cool down. Finishing off our second lap, I laid out the next few classes that would focus on some of the finer details and tactics for successful racing. SDR will skip next week, as I will be away for work. We will return on 23 November where will cover sprinting more in depth. Forgive my ignorance here but how do I get signed up for these sessions? We do the SkillZ and DrillZ Ride every Wednesday at 6:30 PM East Coast US time. Hope you can join us.